The Anaktuvuk River fire scorched 1,000 square kilometers of Alaskan tundra in 2007. A year later (rollover), vegetation that survived and re-sprouted is returning to the charred earth. Burning of the Alaskan tundra can release massive amounts of carbon dioxide, the major greenhouse gas, according to a study published in Nature this week. The Arctic is warming faster than the rest of the planet, causing scientists to wonder what will happen to the carbon that plants have stored in Arctic soils and plant matter, both living and dead. The new study looked at the aftermath of the Anaktuvuk River wildfire, which burned more than 1,000 square kilometers of tundra on Alaska’s North Slope in 2007. Anaktuvuk burned for almost three months, and by itself, accounted for two-thirds of the total area burned in Alaskan tundra since 1950. The immediate cause was lightning, but weather played a major role. Between July and September, 2007, the North Slope had the hottest weather in a 129-year record. When the fire was really roaring, daily highs were 5°C to 10°C above average. The Slope also received less than 20 percent of the average rainfall that summer, leaving the tundra abnormally arid. Tundra covers large areas of the northern coasts. In 2008, Michelle Mack, an associate professor of biology at the University of Florida and her colleagues visited the area and took samples from 1-square-meter quadrants both inside and outside the fire zone. Mack was in the field in Alaska, alas, and did not answer our emails, but her group calculated that the fire oxidized more than 2 million tons of carbon, which entered the atmosphere as carbon dioxide. The movement of carbon through soils, ecosystems, waters and the atmosphere is critical to the issue of global warming. Releasing carbon to the atmosphere as carbon dioxide speeds warming; and storing carbon compounds can slow or potentially reverse warming. The moist acidic tundra under study covers as much as one-third of a billion square kilometers of the global Arctic – making it a major “sink” for carbon dioxide. The 2 million-ton release of carbon was equal to at least 50 percent of the amount of carbon stored annually in the Alaskan tundra, meaning this one fire almost cancelled the anti-warming benefit of photosynthesis in the region. A warming climate could change carbon cycling in the Arctic. Although boreal forest will absorb more carbon dioxide and methane from the atmosphere, increased forest fires and insect damage could release more carbon to the atmosphere. The link between global warming and fire also appeared in a new analysis of Yellowstone National Park. “Large, severe fires are normal for this ecosystem,” said Monica Turner, a Yellowstone expert and professor of ecology at the University of Wisconsin-Madison. Historically, the entire Yellowstone landscape has burned every 100 to 300 years, but Turner and company calculated that current trends toward hotter, drier summers, mean fires could consume the entire area every 30 years by 2050. 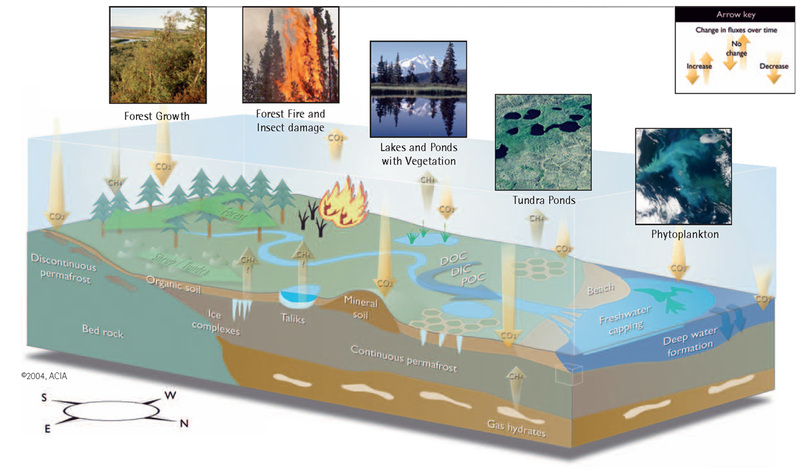 PERMAFROST: The Anaktuvuk fire burned off much of the insulating layer above the ever-frozen permafrost layer – an essential part of many Arctic ecosystems whose melting is causing major ecological change and destabilizing roads and buildings. The soil profile to the right shows the interior of this stunning Alaskan landscape. Notice that permafrost (the white layer) is protected by an insulating layer of plants and soil. REFLECTIVITY: Fires may increase the “albedo,” or reflectivity, of the surface, which would reduce the absorption of solar energy. Wildfires in the tundra suggest that warming will produce fires that lead to yet more warming. FEEDBACK: It’s incontestable that the globe, and especially the Arctic, are warming due to the accumulation of greenhouse gases, and that warming is linked to an increase in fires. If warming begets fires, and fires beget carbon dioxide, and carbon dioxide begets warming, we have a dangerous feedback cycle. And feedback moves us from the additive realm to the multiplicative one. In the Arctic, feedback also plays a central role related to the release of methane, which has even more warming potential than carbon dioxide. Many warming Arctic habitats have started releasing larger amounts of methane, which could warm the planet, feed back, and stimulate the release of yet more methane. This feedback, like the one that may be affecting burning tundra, paints a darker picture of what could happen if we ignore the atmosphere and blithely assume that the future will be just like the present. Buried charcoal: Global warming star?